You can listen to the show via Triple R’s on demand service. This reminded me about the interview that I did with Link, back in the day, around when the 10% Weird album was out. In case you didn’t know, The Meanies are the doyens of Melbourne’s indie/punk scene. You can see the video for the song, 10% Weird at the bottom of the blog post. For the interview, I ventured out to Pascoe Vale, in Melbourne’s north. Link was living in a bungalow in a cul de sac street that ended at the perimeter fence of Essendon airport. It was a little bit like the movie, The Castle. Driving back home, I popped the tape in the car stereo, and to my horror, discovered that the batteries in the recorder had cut out. At the same time, I went past a speed camera, and in my agitated state, was pinged for traveling a couple of kilometres over the speed limit. Not great. So I traveled back to Pascoe Vale, and did it all again. The results appeared in Blast Issue 3 (The One With the Purple Cover), I think. Thanks to the wonders of OCR, here it is. LINK MEANIE spends a pleasant afternoon with Ed. He chats about music, touring, pinnies and Jake and the Fatman. Here’s the latest of the retro music posts from Blast! Magazine. 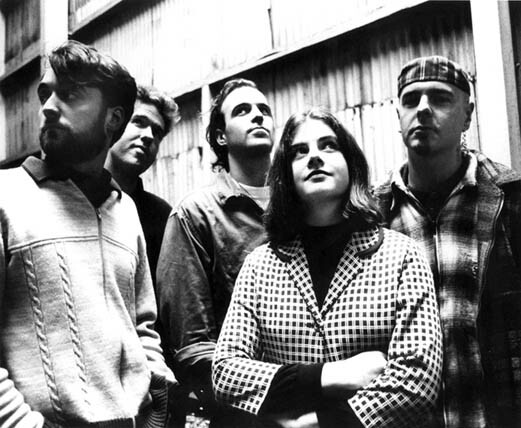 The Steinbecks 1994. l-r Josh Meadows, Robert Cooper, Joel Meadows, Bianca Lew, Adam Dennis. 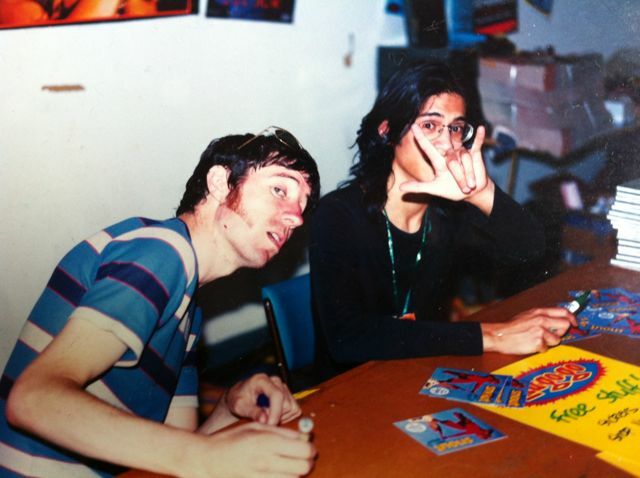 Melbourne’s Josh and Joel Meadows had made inroads to jangle pop notoriety with The Sugargliders by releasing music on Sarah Records, home to such luminaries as Tallulah Gosh!, The Field Mice, and Heavenly. They are also cousins of Tali from The Lucksmiths. From the smouldering ashes of The Sugargliders, rose The Steinbecks. 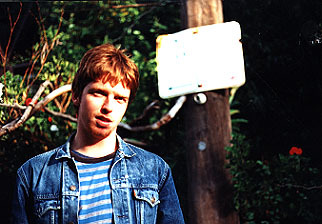 I met up with Josh in early 1995, just after the release of the first The Steinbecks album, At Home and Abroad with the Steinbecks (Summershine). They had launched the album at the now defunct Carlton Moviehouse by screening Head by The Monkees and then playing tunes from their album. Here’s the song “Apollo” from At Home and Abroad with the Steinbecks. People who like the previously mentioned Sarah Records bands will most likely have already heard of The Sugargliders and The Steinbecks. For readers that haven’t, if you who enjoy Camera Obscura, The Bats, or Belle and Sebastian, then you may find The Steinbecks to your liking. This interview appeared in the first edition of the fanzine, and I was lucky enough to have the The Steinbecks play at its launch gig at The Lounge. As I remember, it was a really warm December night with a good turn out. The band image that you can see at the top of this post and the start of the Youtube video is the promo shot that I used in the article. Later, I used to pop into the RMIT University book shop to say hi to Josh, when he worked there. I lost contact with him, but do seem to remember that he went off to do some work in Papua New Guinea. I also caught up with some of their subsequent releases on Summershine and then Microindie Records. It seems that their last release was 2005’s Far From the Madding Crowd. Josh Meadows tells Ed that “Fresh is the vibe. Fresh and up and fizzy” in The Steinbecks camp. Josh – We’ll just test if the coffee sounds good…(slurps)…Ahh! Ed– (Laughs) What’s the vibe in The Steinbecks at the moment? This will be the last of my retro blog posts about Australian, indie bands for the year. I nearly stopped after the Glide post, but decided to press on to get the Snout one up and also this one about Even, because of this week’s Xmas Even gigs. I’ve written about Even before. They are a band I have been into since their first EP came out, at about the time this article appeared. It was in the same issue as the Glide interview, which dates it in the first half of 1995. Even are still going strong, with their sixth studio album of 60’s drenched, power pop, being released recently and available through their website. In addition, many of their records are available digitally, at your favourite download store. My friend Al did the interview and the write up, but I was there at the Black Cat café on Brunswick St, during the interview and I took the photo that you can see below. It was the afternoon of launch gig for the In Stereo EP; their first record. An Interview with Ashley Naylor from top Melbourne “groop” Even. By Al Marshall. Hot on the heels of the post regarding Glide, is another one from the archives about a band dear to my heart – Snout. I went to school with Greg who played guitar in Snout and I used to do stuff like go on tour to Adelaide (the glamour!) with them, lugging gear, selling shirts and so on. I also did two pieces on them for my fanzine. The first, you can read below. The other one was about rock music and pinball, which will probably surface on this blog at a later date. After Snout finished in 2002, Ross went on to release solo albums. 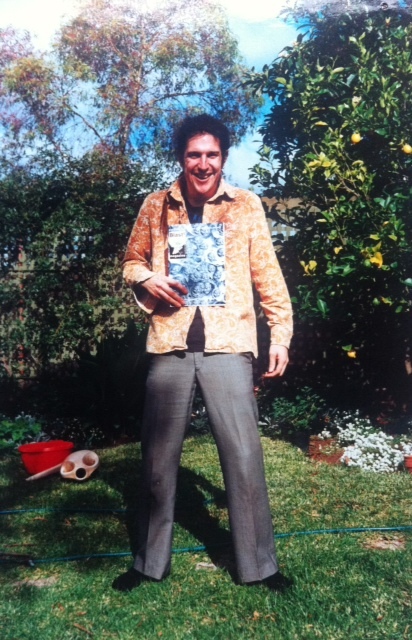 Most notably being nominated for the 2008 Australian Music Prize (equivalent to the Mercury or Polaris prizes) for Sympathy for the New World. Ewan drummed with Dan Brodie and the Broken Arrows, amongst others. While Greg put out a hip-hop inspired EP but then retreated from the music world. This post is timely, as they reformed for a gig at The Tote on Melbourne Cup Day, in November this year, with perennial local favourites, Even. They have been persuaded to play with them again at one of Even’s Christmas gigs on Thursday 22 December at the Phoenix Public House. I’ll be there. I wonder what happened to Ross’ song “Stuntman”? PS – Guess what? I have an Even archival article too. PPS – If there are any typos, it’s the OCR software’s fault! There have been some pretty reasonable musical groups that have performed at the Evelyn Hotel over the years. When you get to read this magazine, it will have just been reopened after renovations. Ed speaks to Ross McLennan (bassist, singer and songwriter) who started the demolitions…while on stage. 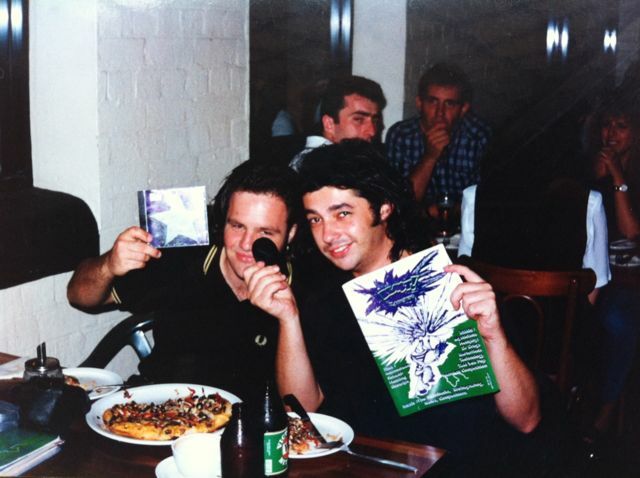 Early in 1995, William Arthur (guitar, vocals), Marc Lynch (bass) and Jason Kingshott (drums), were good enough to meet with me over pizza, beer and a tape recorder on Brunswick Street in Melbourne. This was in advance of a gig at the sadly missed Punters’ Club, in the almost tropical heat of a humid Melbourne night. They chatted about their album Open Up and Croon, upheaval in the band and the coolness of Fonzie, amongst other things. The original interview appeared in issue 3 of Blast!, a fanzine that I was involved with at the time. I’ve republished some of the articles I did for the zine on this blog previously, with only slight editing. However, rereading this interview, I wanted to rewrite the piece as it didn’t really seem to do justice to the music of Glide, so I didn’t want to republish my juvelinia verbatim, but to try and put more context to their story. Here’s part 2 in my (ahem) Blast! from the past. Regular readers would have noticed the Flying Nun Records article that I republished from Blast! Magazine, a Melbourne fanzine I was involved with. I wish I could say that we were inspired by the early 20th Century, modernist journal of the Vorticist movement in the UK, but that would be a lie. I think we just liked the “vibe” of the name. Better writers than I have lionized the works of Robert Forster, Grant McLennan and co. They had a storied past which began in Brisbane in the late 70’s and ended with the untimely passing of Grant McLennan in 2006, with a hiatus from 1989-2000. For the full story, there is the great, in-depth biography of the band by David Nichols, published by Verse Chorus Press. In 2007, a tribute album appeared, as reviewed on Mess+Noise. A lesser known tribute was realeased in 1996 on Hippy Knight Records. I commissioned an article about the making of this album for Blast! #5. It was written by a chap named Craig Barnes, who was more commonly known as “Cousin Creep”. I would see him around town at gigs and he also went on to present a show on Triple R. When I heard that he was putting together the record, I asked if he would write a piece chronicling how he did it. Back in the day, I was a co-founder and contributing editor for a local fanzine called Blast!, We were essentially a small group of University of Melbourne students with some (emerging) Quark Xpress and Photoshop skills, who threw together a publication about culture, music, art and so forth. I pretty much concerned myself with the music articles, interviewing (mainly) Australian bands and reviewing (free!) CDs. I also organised launch and benefit gigs to help to fund our shoestring operation. From New Zealand with love…As regular readers would know, I love to promote the local scene and Australian artists; just look at…the back issues of Blast! However this edition has interviews with Robert Scott of Magick Heads, The Bats and the Clean fame; David Mitchell and Denise Roughan of the 3Ds; Alf Danielson and Norma O’Malley from Chug; and David Kilgour of The Clean and Stephen. November 2011, is the 30th anniversary of Flying Nun records. So in recognition of that, I have iPhone OCR’d my article from August/September 1995 and grabbed some photos from my photo album. Reading the article now, I realise I didn’t actually describe what the music sounded like. This is probably why my music journalism career didn’t take off. So I’ve added some 2011 notes and embedded some examples of songs, along with some minor copy edits. For an overview of Flying Nun Records, here is their Wikipedia entry. Here is a 2009 article from The Guardian about the label. Here is an Oz/NZ playlist I have on Youtube which has a Flying Nun Records documentary on it. Finally, here is FN’s “Greatest Bits” compilation. 30 years, 40 tracks, 20 NZ dollars! 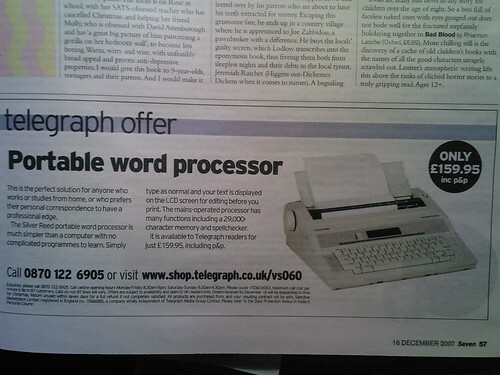 It’s Xmas Eve and I hope that Santa will bring me a Portable Word Processor as seen in a recent Sunday Telegraph TV magazine! 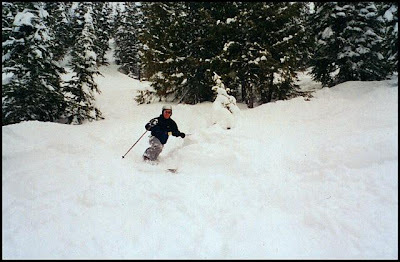 P3 Retro – Birthdays and knee deep powder! Even though I get millions of hits on this blog, only a few of you will know that my International tales of the minutiae of life actually started in 2000 on the now defunct eGroups.com (taken over by Yahoo! groups). Here’s some P3 retro; birthday stuff from the Yahoo! group archives…April 1 2001. Back then, I thought that using capitals at the start of sentences was soooo “off-line”. Anyhow, that year I had one of my best birthdays ever at Silver Star Mountain in British Columbia, Canada. like it was 1999, it being near the end of the season and all. thin sheet of plastic with 2 handles cut into it that you sled on. headwall, rusty whistle, aabye rd etc. he terain park tomorrow and try and get some hits off the jumps.